Deformed Ordovician marble on Mt. Harrison in Idaho's Albion Range. Photo by Bob Carson, Professor of Geology & Environmental Studies, Whitman College, Walla Walla, Washington. Collegiate introductory Earth science courses are frequently terminal science courses for non-science majors. As a result these courses, such as the introductory physical geology course in this research study, are the final opportunity Earth science instructors have to support and develop student learning in the sciences. The use of inquiry-based learning (IBL) and multiple representations (e.g., physical models and information technology) has been a call for reform in science education and may be a means to reach students in introductory courses. This research tested the pedagogical coupling of IBL and multiple representations to support introductory students' conceptual model development of the complex and dynamic Earth process, eutrophication, through the evaluation of student drawings and written reports. In this research, participants from nine laboratory sections were randomly placed into experimental (IBL and multiple representations style labs) and control (workbook style labs) groups. Statistical results indicated significant (ρ < 0.05) pre-post differences in the conceptual model drawings in only the experimental group, where student performance on the reports and drawings were significantly different (ρ < 0.01) between test groups. These results indicated that the use of IBL and multiple representations had a positive impact on introductory students' conceptual model development of eutrophication. Environmental History of the Southwest is a general science education course at the University of Arizona with an emphasis on human-environment interaction of the past and an objective of preparing non-science majors to understand and critically evaluate contemporary environmental issues. The American Southwest is well suited for such a course, as it is rich in many data sets of paleoenvironmental reconstruction techniques and has been inhabited by humans for thousands of years. Lectures are grouped into three parts. 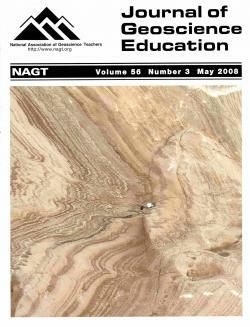 Part 1, Background, covers geology and climatology, paleoenvironmental techniques, and ecosystems. Part 2, Past Environments and Societies, covers environmental changes since the late Pleistocene and human response to and interaction with those changes. Part 3, Modern Environmental Issues, covers contemporary environmental issues as well as past analogs of these issues for comparison. Lecture topics are interconnected with one another, making for a comprehensive study of environmental history. Several elements of science are revealed and discussed, improving general science literacy among the students, who are mostly non-science majors. Other regions of North America have had long-term human habitation and are also rich in multiple data sets of paleoenvironmental indicators, so nearly all of the continental U.S. and Canada is suitable for a course on environmental history and human-environment interaction. By means of Montessori education, children aged from 3 to 6 years were introduced to the basics of earth-sciences in general and of glaciology in particular. For this purpose, a one-year-program was established under the principles of Cosmic Education (Sensu Montessori) in order to provide an insight in some parts of the aforementioned sciences via 3 steps. Step 1 brought up introductory informations about earth sciences, historical geology, planetology, and climatology. In Step 2, specific information about the Ice Ages and glaciology was given by introducing a story about a personified glacier which included information on mass budget (ablation/accumulation), dynamics, features (crevasses), and in relation to those, the dangers of a glacier. Step 3 completed the program by giving the children the opportunity for depicting and acting out their knowledge via glacier-"modelling", painting, dancing, and making music. After this one-year-program the children were able to give a simple account of the basic principles of climatology and glaciology, which may contribute to a more careful and respectful attitude towards their environment. The program turned out as a helpful and appropriate tool for giving an introduction into the great cycles of nature to preschool children, not only in nursery schools, but also at home with their families. In addition, the interactive and hands-on ways of presentation described were responded by the children with interest and sometimes enthusiasm, which is taken as further evidence for the tool's efficacy. A semester-long hydraulic containment design project provides a practical application of the topics covered in an introductory hydrogeology course, and serves as a better vehicle than traditional approaches for integrating the topics. Traditional homework assignments typically contain stand-alone problems or groups of problems that are isolated from other assignments of the course. In this design project, the knowledge needed to complete the design is developed in an integrated manner from material covered throughout the course. A project was developed based on a simulated hypothetical aquifer for which students were provided various types of data. After analyzing the data using appropriate methods learned throughout the course, students obtained estimates of parameter values that they then used in the design of a hydraulic containment system. A survey of the students showed that the project provided a better learning experience than homework, and provided additional benefits such as seeing the interconnectedness of course topics, learning to discriminate among data measured at multiple scales, and accounting for uncertainty in measurements. Involvement of scientists in education is essential to strengthen quality and access to US science education at the K-12 and higher levels. Yet little research evidence exists to help practitioners understand scientists' education and outreach interests, beliefs, and motivations, and the barriers that must be addressed to involve them effectively. The ReSciPE Project (Resources for Scientists in Partnership with Education) has offered professional development workshops and resources to a wide audience of working scientists who undertake individual or institutional education and outreach activities. While seeking to increase the effectiveness of these "education-engaged scientists," the project also conducted research on scientists' involvement in education. We report findings from qualitative analysis of 30 in-depth interviews and propose a comprehensive framework for addressing scientists' needs for professional development in this domain, placing these findings in context of national needs and efforts to engage scientists in education. The demonstration described in this paper attempts to illustrate the main controls on the vertical circulation of lake water. This phenomenon integrates the effects of annual air temperature cycles, fetch, and possible groundwater sources to a lake. Because the nature of a lake's circulation pattern has an effect on the "quality" of the sediment record preserved, it is among the most important limnological processes for students to understand. This demonstration involves a fish tank, colored water, salty water, and artificial sun and wind. The water in the tank "evolves" through the seasons of a typical meromictic lake, beginning with Spring turnover and ending with Fall turnover. The demonstration requires several hours to complete, and students measure water temperature and conductivity through the model year. I have found this demonstration to be a helpful illustration of dimictic and meromictic lakes; it is especially helpful to illustrate the seasonal evolution of lake water, which is not apparent during winter field studies of local northeastern US lakes. Effective instruction hinges in part on understanding what prior knowledge students bring to the classroom, and on evaluating how this knowledge changes during instruction. In many disciplines, multiple-choice tests have been developed to gauge student prior knowledge and assess learning. In this study, a 15-item version of the Geoscience Concept Inventory (GCI) was used to assess the prior knowledge and learning of students enrolled in an introductory physical and historical geology course specifically designed for preservice elementary (K-8) teachers. Gains (pretest to posttest) among participants (n = 122) averaged 4%, similar to gains reported elsewhere. However, gains among participants enrolled in revised course sections (n = 84) averaged 7-8%. Detailed analysis shows that statistically significant gains occurred on test items related to geologic time, earthquakes, radiometric dating, and tectonics. Items for which the greatest gains were observed correlate with teaching method; classroom activities coupled with discussion and supplemental reading appear most effective in increasing student knowledge. Our interpretation of the GCI results suggests that students need multiple opportunities to work with geologic concepts in a variety of formats, and provides further evidence of the persistence of student prior knowledge in specific topics. The 10 cm dry-erase cube is an effective tool for illustrating the three-dimensionality of geological features in maps, cross sections and block diagrams, and it aids in the understanding of stereographic projections and orientated samples. It is ideal for use in classes and labs of structural geology and geological field methods courses. The cube is useful for demonstrating the three-dimensional relationships among any planar or linear features in geoscience courses at any level. TRUST, or Teacher Renewal for Urban Science Teaching, is a National Science Foundation funded Earth science teacher preparation partnership between the American Museum of Natural History and Brooklyn and Lehman Colleges of the City University of New York. Our research and practice form a promising and replicable model for formal-informal partnership between teacher education programs and science-rich institutions such as museums, zoos, and botanical gardens. The model takes a problem-based approach to urban teacher shortages by focusing on the knowledge required for Earth science teacher certification. The initiative included two types of participants, teachers seeking Earth science certification and teacher leaders/school administrators seeking to improve science instruction in their schools. Key features of the model included new college-based courses that focus on Earth systems science and urban Earth science investigation and a two week museum-based summer institute emphasizing essential questions, interactions with scientists, and approaches to science teaching outside the classroom. The overall findings after four-years of implementation, action research, and external evaluation indicate that the model successfully provides timely and relevant approaches to partnership that complex urban situations require. Students often leave introductory geoscience courses without learning the scientific perspective, and we developed Lecture Tutorials to help alleviate this problem. Lecture Tutorials are 10-20 minute interactive worksheets that students complete in small groups in class after a short introductory lecture. They are specifically designed to combat alternative conceptions and increase learning on difficult topics. Our study shows that Lecture Tutorials increase student learning in the classroom more than just lecture alone. On related multiple choice questions asked before and after the Lecture Tutorial (but after a short lecture on the topic), student scores increased 19%. When a subset of these questions was given before and after an extended lecture instead of a Lecture Tutorial, student scores did not increase by a statistically significant amount. On the multiple choice assessment questions given on exams relating to the information covered in the Lecture Tutorials, students who completed the Lecture Tutorials scored significantly higher than students who heard just lecture. In addition, students feel that they are an important and useful part of their learning experience. Lecture Tutorials are being disseminated and are available for instructor use.